Say you’re the director of a small theater company in the District, and about two years ago you saw a young actor do some excellent scatting on a trumpet at a Fringe Festival show. Now you are looking to cast a male actor who can play the trumpet, but you can’t for the life of you remember his name. Short of stalking actors who like jazz on Facebook, which is creepy, how are you ever going to find him? There is now an app for that — or, more specifically, a database. 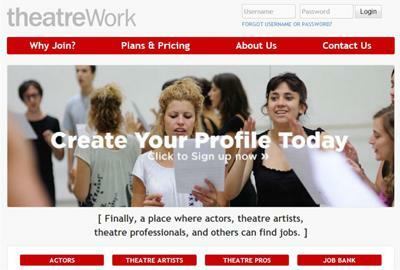 TheatreWork.org is a new online database of Washington area performers who are looking for gigs. The site officially launches this week, but in the first month that it’s been functional, more than 200 performers have created profiles, listing everything from their musical skills to whether or not they have visible tattoos. The Alexandria-based design and marketing firm Unconformity is creating the site, using modeling agency databases as, well, models. Which is not to say ­TheatreWork is the first database of its kind — two Minnesota nonprofit groups run similar Web sites, but those are open to the public and are not searchable according to specific details, such as Zip code and 23 designated performance skills, from juggling to martial arts training. Thus far, TheatreWork is open only to performers. Barring any Affordable Care Act-type snafus, Watkins hopes to give approved theater professionals ­password-protected access to search the database by late spring. For performers, basic profiles will always be free, but after the first six months, they’ll need to pay $29.95 a year to keep a full profile online, complete with a work sample video and multiple head shots. “That’s the price of a few trips to Starbucks,” Watkins said. Here’s how it works: The performer creates a user name and password and then encounters a page with more than 50 questions and fields to fill in. It starts with the basics, such as contact information, address and whether or not the performer is a member of a union. He or she uploads a résumé and pictures. Then the site poses more than two-dozen questions about physical appearance. How do you describe your physique: Muscular? Stocky? Overweight? Are you willing to cut or dye your hair for a role? Do you have an identical twin? Better yet, are you a triplet? Performers can select multiple age brackets but are asked to identify just one “ethnic type,” which seems unfair to biracial actors or performers who may personally identify with one ethnic type — say, “Mediterranean” — but know they could play a part written for a “Middle Eastern” actor. Forced categorization aside, TheatreWork has the potential to improve the racial diversity of casting on area stages, or at least make it easier for directors to find local performers of color. As an example, Clements cited Studio Theatre’s 2010 panicked search for a young African American actor to star in “Superior Donuts,” which required bringing auditioners down on a bus from New York. “That may not have to happen next time,” she said. “This is a fabulous way to get the names and faces of local actors out there,” said J. Fred Shiffman, an agent with the Capital Talent Agency. He represents about 100 professional actors from the Washington area, and he’s encouraging his clients to create profiles on TheatreWork. Watkins called Shiffman early in the development process and was surprised to find the agent so enthusiastic. “I do not view this in any way as competition,” Shiffman said. Their common goal is to help find work for local actors and discourage theaters from defaulting to New York auditions. Watkins points out that hiring local actors is often cheaper, because if a union performer lives more than 50 miles from a venue, the theater company has to provide housing. “It’s that Zip code function that people are going to be searching,” Watkins said. There are no restrictions on who can sign up, however, and nothing to keep an actor who is actually based in Chicago from registering using the address of a college pal who lives in Columbia Heights. Local college acting programs are a big potential market for TheatreWork. Not only could students potentially get plugged in sooner, they might form relationships with directors and be more inclined to stay in town after they graduate. Michael Dove, artistic director of ­Forum Theatre, has turned to both the University of Maryland and Howard University to find young actors of color. But to him, as the director of a small theater with limited resources, the biggest benefit is going to be speeding up the casting process, while reaching a larger talent pool. “To be quite honest, sometimes when I’m casting I’ll use Facebook, so I friend a lot of actors, but that’s not an efficient way to do it,” Dove said. He described his casting director as a “very, very part-time” employee. Sometimes when theaters appear to be casting the same people, he said, it’s not because there’s some kind of exclusive club but because it’s tough to find the time and money to do a more thorough search.